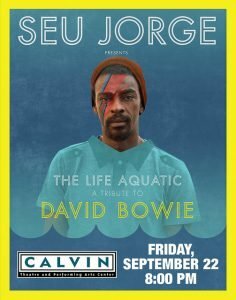 Seu Jorge, one of Brazil’s most talented contemporary singers, performs a tribute to David Bowie this Friday at The Calvin Theatre Northampton. Jorge rose to international fame in the Wes Anderson film A Life Aquatic for his roleas Pelé dos Santos, a singing sailor who performs several of Bowie’s songs in Portuguese throughout the film. Replicating that magic, Jorge performs against a backdrop of images from The Life Aquatic.